Check your daily Battle duration at Settings. You have 300mins of Full EXP, and drop rate everyday. Unused time can be accumulated up to 600 mins. If player in fatigue, EXP and drop rate will decrease. PVP is not counted into the battle duration. If player are in fatigue, only the player is affected, other party member are not affected. If party member are in the same map and in battle, battle duration will be counted for all party member in the same map. MINI and MVP are not affected by the fatigue decrease EXP and drop rate. Fatigue reset daily at 5am! Battled Duration interface change to A/B, A as today used battled duration, B as battle duration you can use. Remaining battle duration can maximum accumulate up to 600 mins. 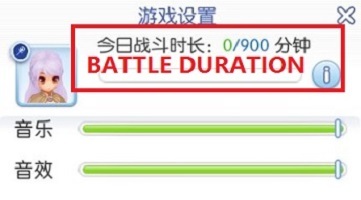 Non VIP card member 【限定特典】will have 600 mins accumulated + 60 mins 【留声机恢复-Music recorder recovery】+ 300 mins (today) = Total 960 mins of battle duration. VIP card member 【限定特典】(Not applicable to SEA – check Premium Card description) will have 600 mins accumulated + 60 mins 【留声机恢复-Music recorder recovery】+ 400 mins (today) = Total 1060 mins of battle duration. At【留声机 -Music recorder】can recovery battle duration maximum up to 60 mins per day and will be calculated into B, but will not be counted into accumulated battle duration. 【留声机- Music recorder】’s battle duration will be used up first, if 【留声机- Music recorder】recovered battle duration is not used up, it will refresh back to 0 mins at 5am everyday. Guide on Music recorder here! Note: You can change your character info viewing by others at the bottom of Setting page.